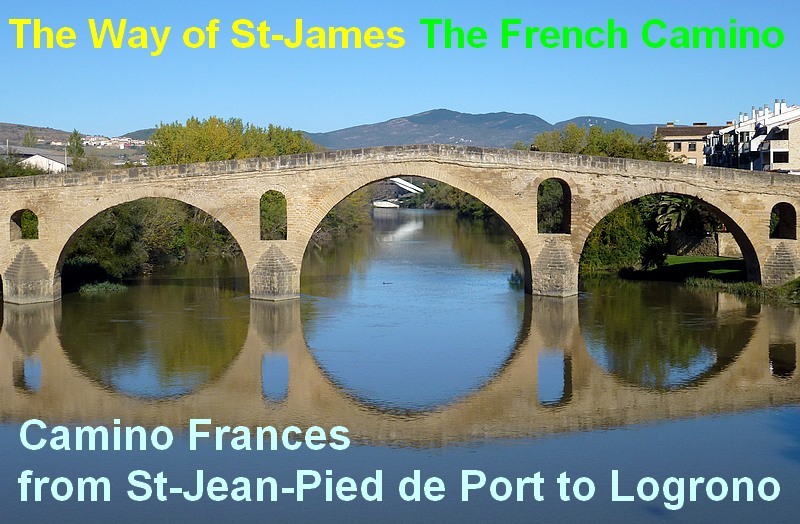 I’ve been preoccupied with the Camino de Santiago, or the Way of St. James, for over a year. I can’t shake the pilgrimage from St. Jean Pied de Port, France across northern Spain to Santiago out of my head. 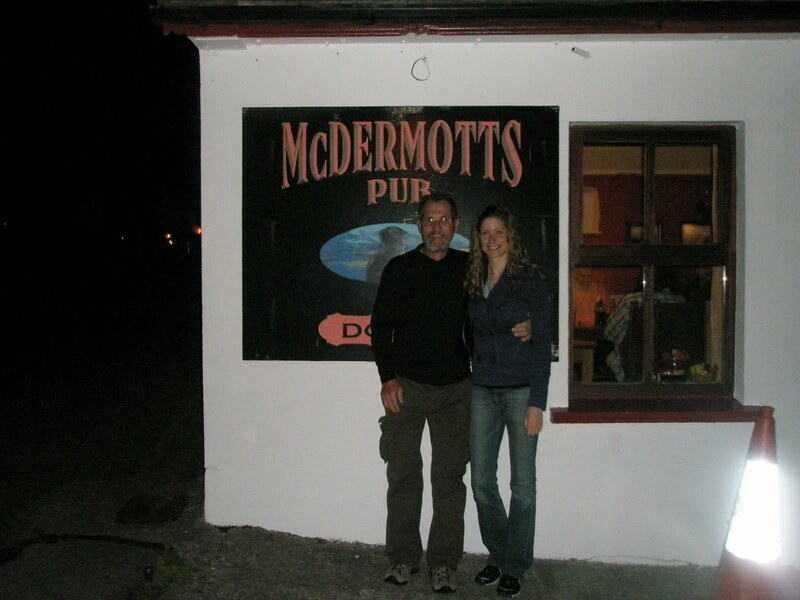 I recently spent time with a writer whose daughter hiked it twice–a sign possibly? 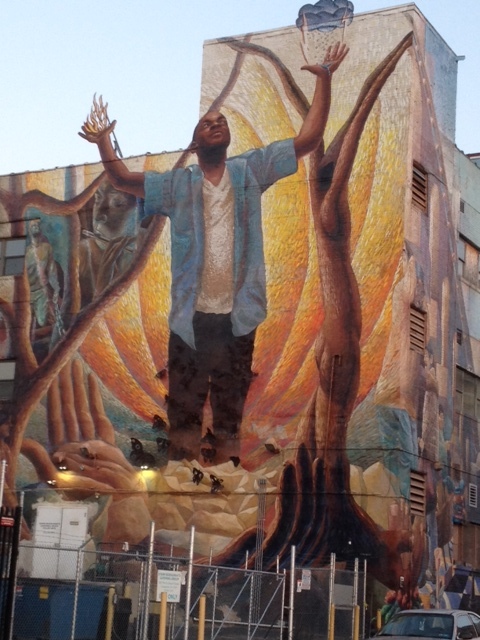 View these photos and you will no doubt understand my fascination. 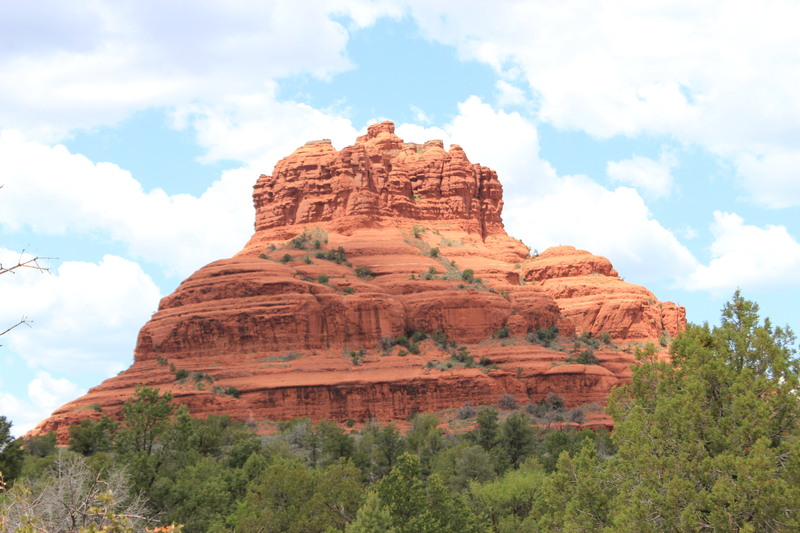 There is no question why Sedona, Arizona is called Red Rock Country. The landscape radiates a tone of red that defies description. 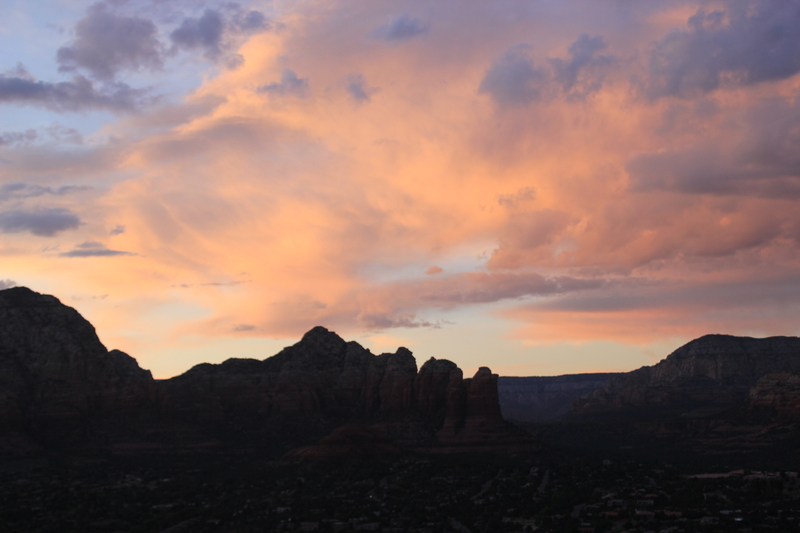 Stay in Sedona for any length of time and it gets in your blood. You wake up in the morning and eat breakfast looking at the red monuments. Go for a walk during the day and it is everywhere you look. In the evening the sunsets a fiery red that looks as if the sky in ablaze. 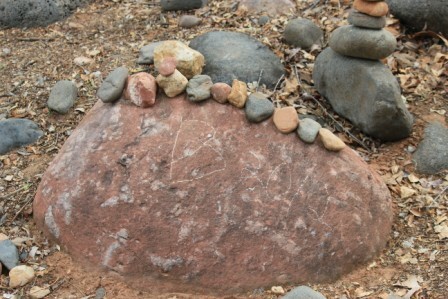 The Brennan family rock formation–one rock represents each person. 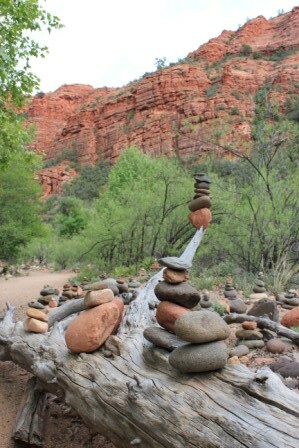 Scenic hiking trials in Sedona are plentiful, but one of the most fascinating is Buddha Beach. 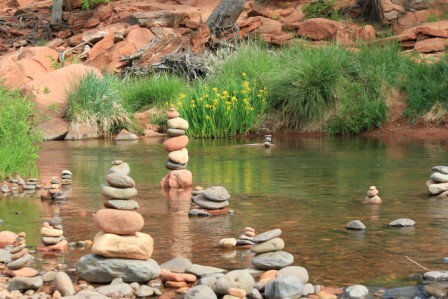 The unusual name is enough to lure even the mildly curious around the bend on Oak Creek, and once the hundreds, even thousands, of rocks balanced on top of one another come into view, there is no stopping. 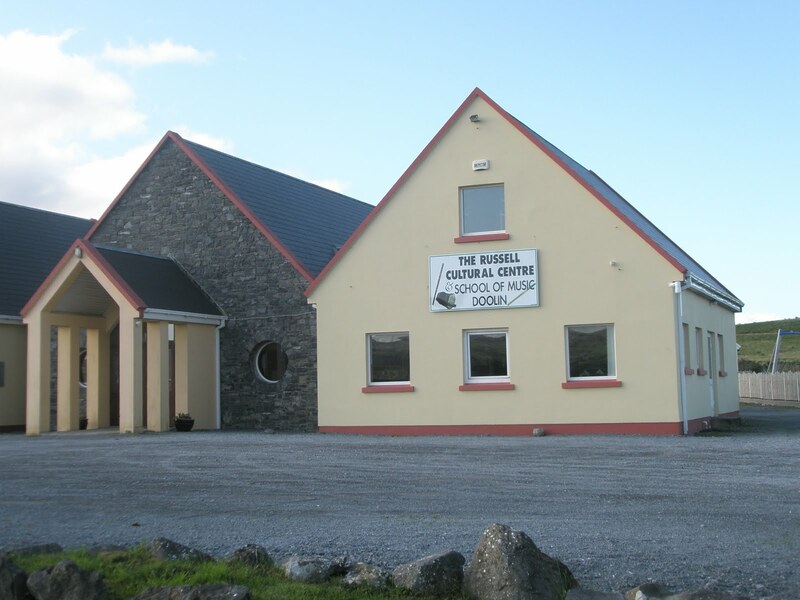 The site is so captivating that building a rock formation of your own is irresistible. Rock and stone balancing was introduced in the Philippines as a type of environmental art. Interpretation of the art form alludes to a meditative process that gives the practitioner a sense of calm and inner peace. Standing on Buddha Beach surrounded by rock formations in every direction is captivating and therapeutic, and everyone I watched come around the bend on Oak Creek had the same reaction. See all photos of Buddha Beach here. 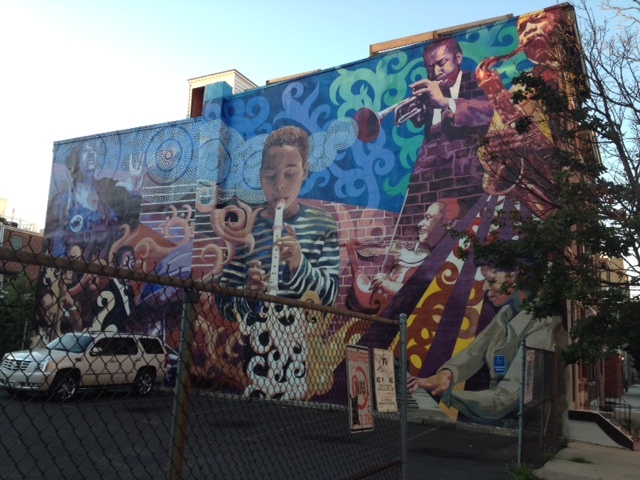 I’ve been running the streets of Philadelphia my entire life, yet it wasn’t until recently that I thought to shoot some of the stunning artwork that surrounded me at every turn. Come along for the ride. 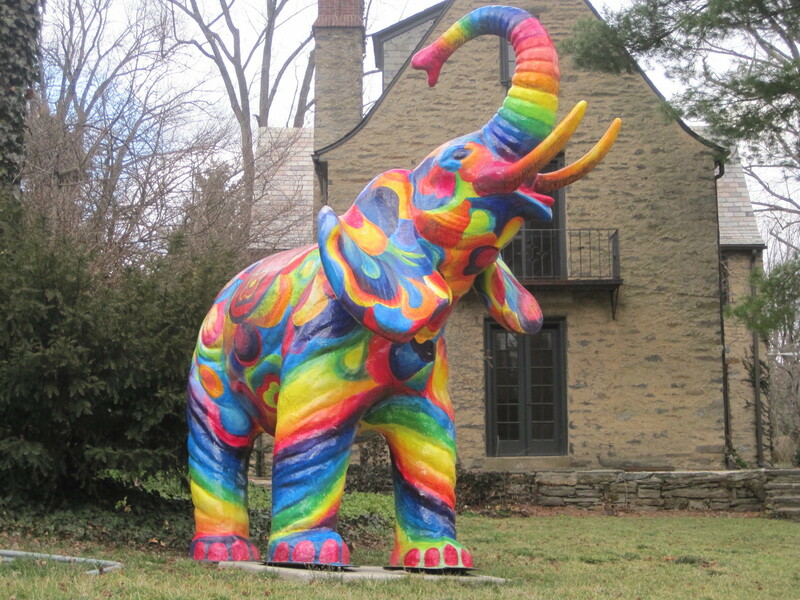 Rainbow elephant that formerly resided on the front lawn of a homem in West Mount Airy. 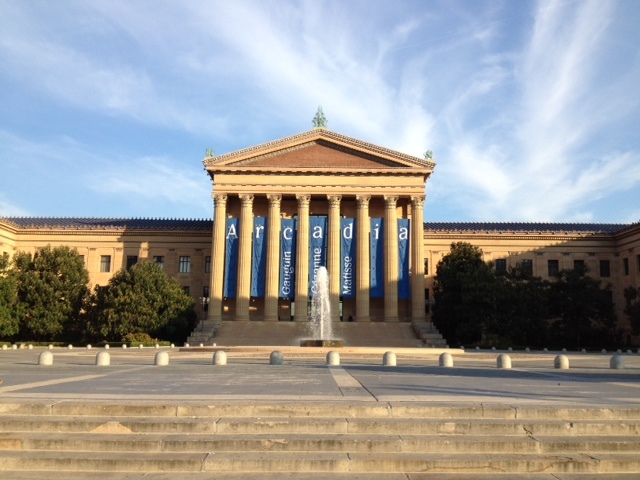 The majestic Philadelphia Musuem of Art at the foot of Benjamin Franklin Parkway. 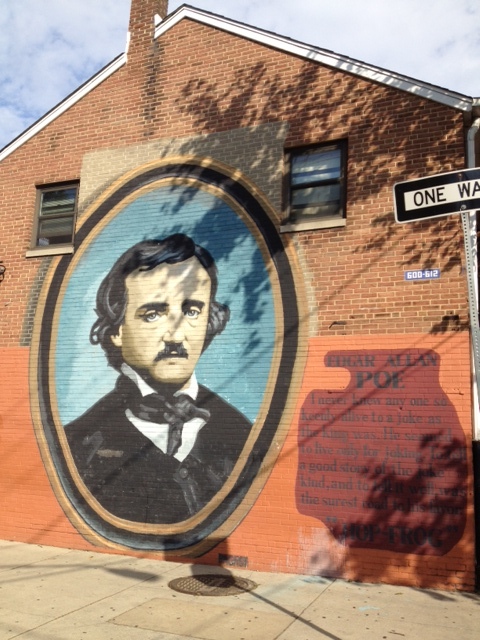 Mural of Edgar Allen Poe across the street of the Historic Site at 7th & Green Streets. 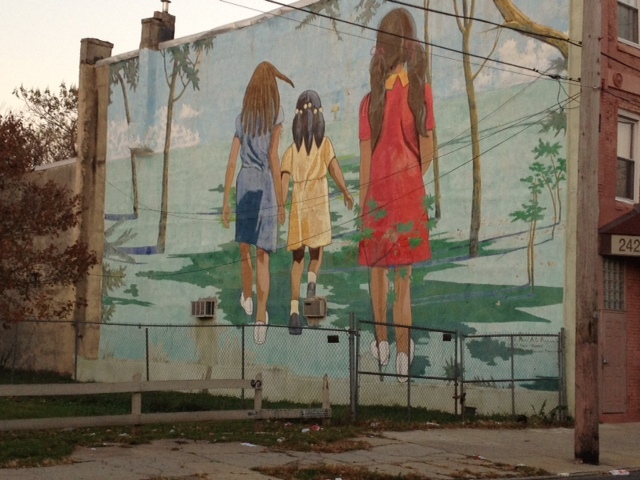 Young girls holding hands on a mural on Ridge Avenue. 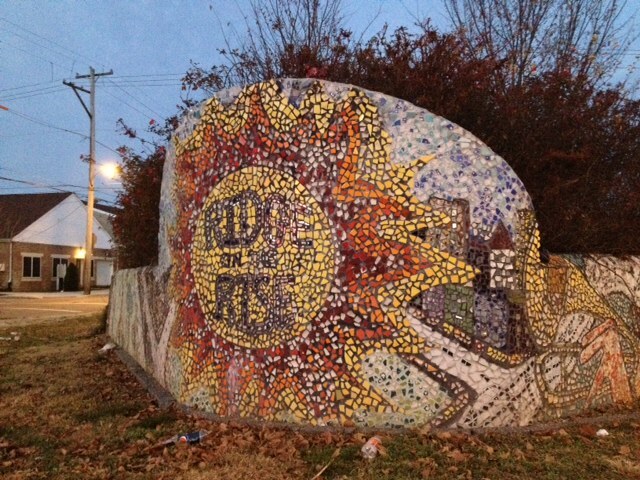 Mosaic “Ridge on the Rise” on Ridge Avenue. 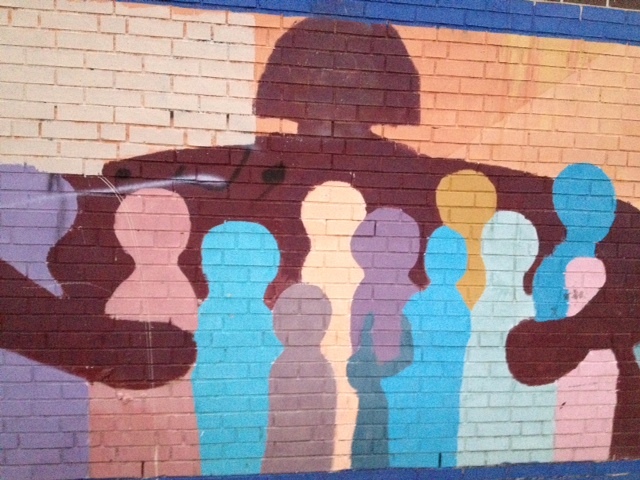 Hug the children in schoolyard on Cecil B. Moore Avenue. 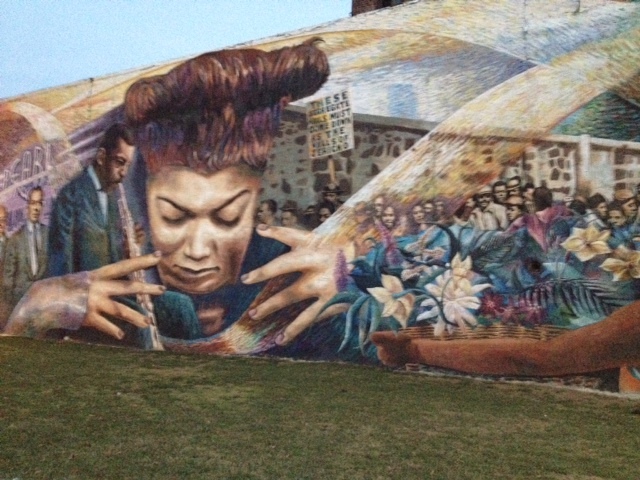 Mural at 12th & Fitzwater Streets. 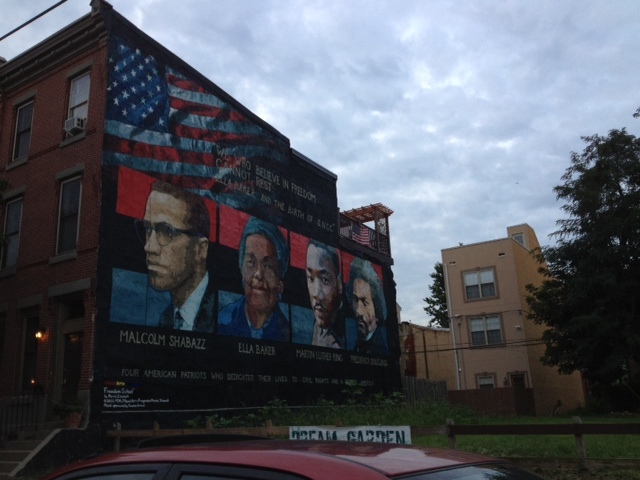 Civil rights leaders on Girard Avenue near 30th Street. 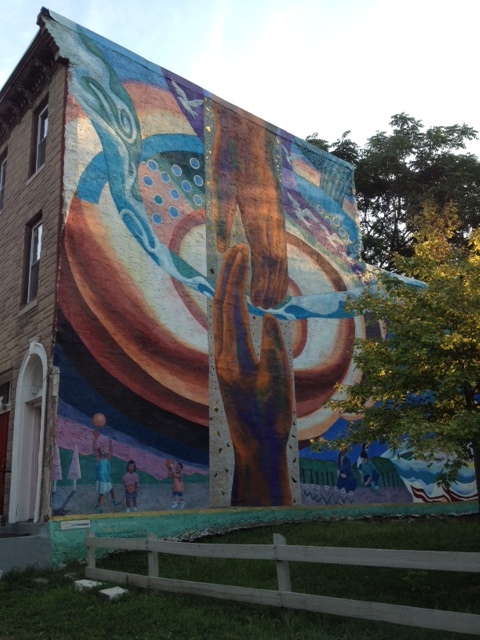 Joining hands on Ridge Avenue. Chamonix is a magical town. Nestled in the French Alps, it is surrounded by the highest mountains in Western Europe, accentuated by the imposing Mont Blanc, its highest peak. The town became so popular as a ski destination that it was selected to host the first Winter Olympics were held there in 1924. 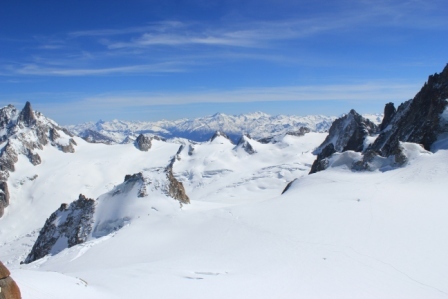 Mont Blanc is so stunning, that to describe it as majestic would be like calling Michelangelo’s masterpiece on the ceiling of the Sistine Chapel a really good painting. 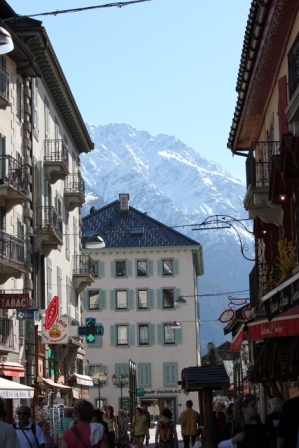 Chamonix is as unpretentious as it is spectacular. 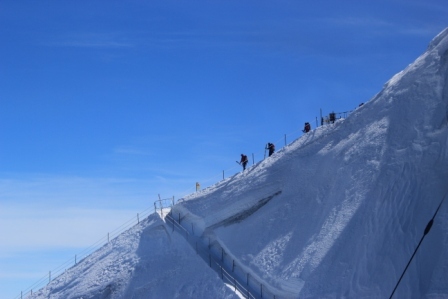 No signs or directions clutter the half-mile walk from the cog railway terminal to the Place de l’Aiguille du Midi cable car terminal, yet it is the liftoff point that carries passengers to observation terraces to view the highest mountain in Western Europe. We walked the crushed-stone path until it transitioned onto a small street and an alleyway before a large stone building suddenly stood before us at a dead end. Steel cables extended from the rear of the building and cable cars shot up into sky. 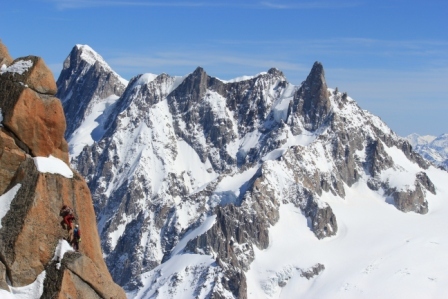 There lie the intrigue and romance of Chamonix—unadulterated nature so powerful it is its own promotion. 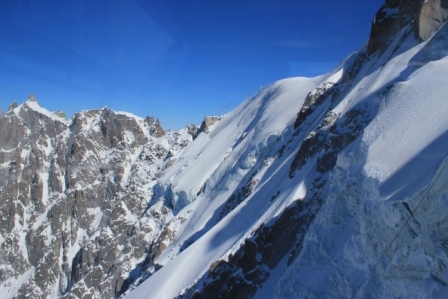 My wife and I hopped the lift up the mountainside to Aiguille du Midi, or Needle of the South, the most spectacular of the high-altitude destinations. There are few places in the world where ordinary tourists stand shoulder-to-shoulder with mountain climbers, and senior citizens rub elbows with paragliders. We were crammed like sardines into a metal box with hard-core Alpinist who were armed with ice picks and ropes, and wore seven-day growth upon their face, while curious travelers had only cameras in hand and wore anxious looks. The town disappeared as the highest vertical ascent cable car in the world shot up the face of the mountain. At the end of the line, the doors opened and we were greeted by Mont Blanc. 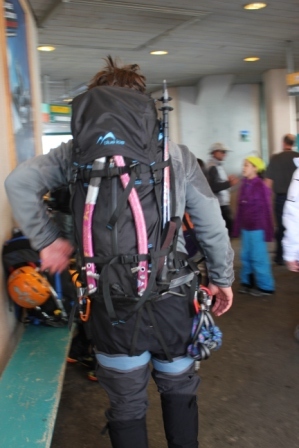 Mountaineers, skiers and paragliders walked down a passage through a tunnel on the left to the departure point onto the Vallee Blanche, an ungroomed twenty-kilometer run of snow and ice that was neither marked nor patrolled. 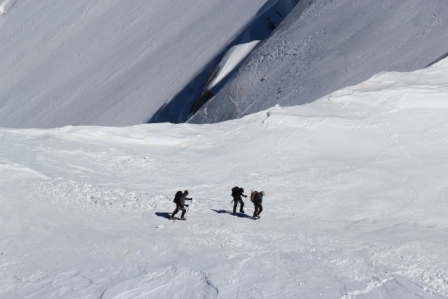 Danger warnings were posted that recommend a guide and mountaineering equipment; ARVA (device for finding victims of an avalanche), shovel, probe, harness, crampons and rope to those who venture onto the mountain. Tourists wandered to the five terraces that look out over the Alpine Range with spectacular views across France and into Switzerland and Italy. The highest platform, Summit Terrace, is accessed by yet another lift that carried us up two hundred feet before opening to a spectacular 360 degree panoramic view. Looking across the mountaintop at Mont Blanc, Helbronner peak in Italy and the entire Alpine Chain was a rare spectacle for us, and anyone who is more acclimated to elevations closer to sea level. The paragliders, skiers, and Alpinists soaring high above and down the mountainside were just as captivating as the scenery. Peering down into the Chamonix Valley from the terraces is a sight no different from looking down from an aircraft, yet adventurers exit the cable car as nonchalantly as an old man order toast in a café while the newly initiated tourist walk white-knuckled along the rail of the observation decks to watch. 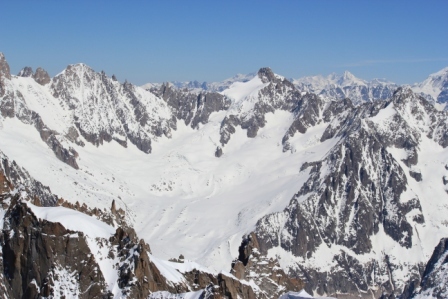 The allure of Mont Blanc and the surrounding peaks is not unlike that of a holy shrine to a pilgrim. I noticed unmistakable expressions of reverence and respect on the faces of both natives and visitors, whether walking through town or inside a cable car on a ride to the top of the world. The tragic death of the adventurers was an unimaginable; their resting place majestic and so near to the heavens. 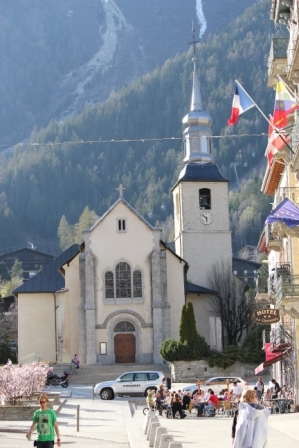 Chamonix coexists in its magnificent surroundings, like a denizen sharing a room with a deity. The ambience of the town—its architecture and people, its way of life—breaths homage to the natural wonder that watches over it. Chamonix’s embrace is instantly contagious and difficult to let go, like saying goodbye at an airport terminal to a child who is going overseas for the first time. Driving in silence from town and looking into the rearview mirror, I was convinced I’d just departed hallowed land. 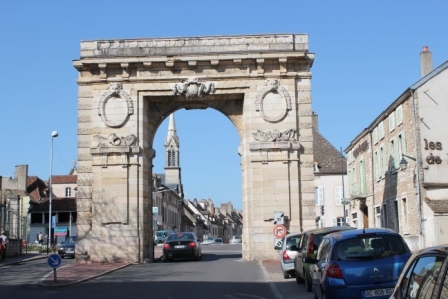 Beaune is known by many as the wine capital of the Burgundy region of France. Nestled in world-famous vineyards including Pommard, Corton-Charlemagne and La Romanee-Conti, Beaune has an Old World feel. A wall and moat once surrounded the town, some of which remain today. 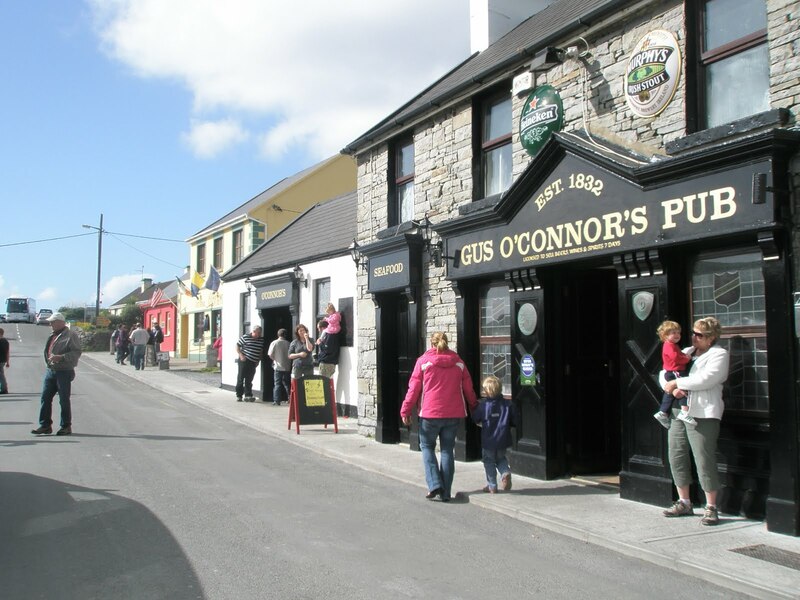 The main road encircles the town, which is dissected by narrow streets that are lined with shops, restaurants and wineries. The town has a rich heritage that centers on food, wine and hospices, the most famous the Hotel-Dieu dating back to the 1700’s. View of the Jardins de Lois from the courtyard. My wife and I stayed at the Jardins de Lois during our stopover in Beaune. 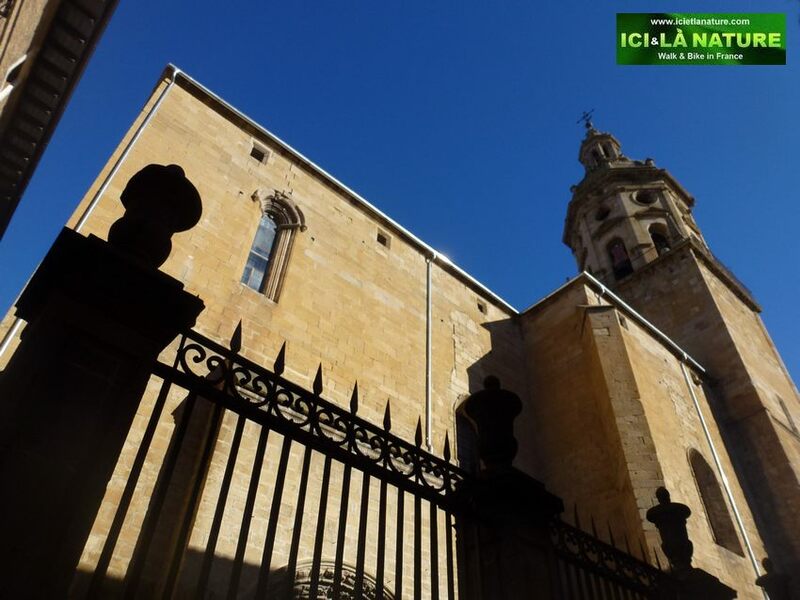 The property is conveniently situated on the main road that goes around town, and the façade is in perfect harmony with the surrounding architecture. 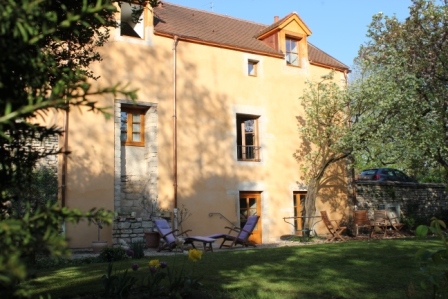 When we arrived we learned that other guests had extended their stay, so the manager offered us the Clos des Renardes for the evening. The apartment was magnificent, from the design and structure to the furniture and décor, and had two windows that opened out to a beautiful garden. The manager was gracious enough to make reservations for us at the wildly popular restaurant Les Caves Madeleine, then in the morning welcomed us to breakfast, which he served. We found the Jardins de Lois welcoming, cozy, clean and charming. Hotel Dieu was founded in 1443 and has been called the soul of Beaune. 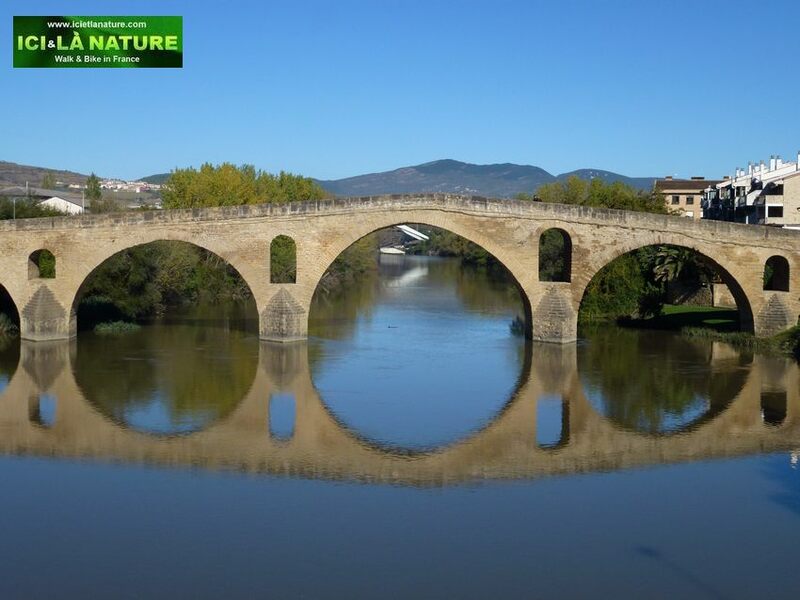 The structure is a masterpiece of gothic architecture and an essential element in French history. Its history dates back to the Duke of Burgundy, Phillip the Good, and his wife, who created the hospice for the poor. Aged, orphaned, women with children, poor, sick and infirmed occupied the hospice from the Middle Ages until the twentieth century. Beds line the inside of the vaulted “Room of the Poor,” where religious services were held so patients could attend. The colorful glazed tiled roof covering the huge structure is so spectacular it grabs a visitors’ attention the moment it comes into view. The property is home to stunning artifacts including wrought iron artistry surrounding a well in the courtyard, which predates the building, and the likeness of Christ sculpted into an oak trunk. 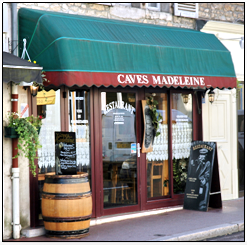 Caves Madeleine on Rue Faubourg Madeleine, is unpretentious and serves authentic French cuisine. Our dinner at Caves Madeleine was an experience in authentic French dining. We walked past the restaurant, expecting from its reputation that it would somehow stand out. Rather, it sat comfortably and inconspicuously among storefronts along Rue Faubourg Madeleine. The layout of the restaurant is homey and encourages socializing, with long communal tables where patrons sit side-by-side and share an extraordinary experience. 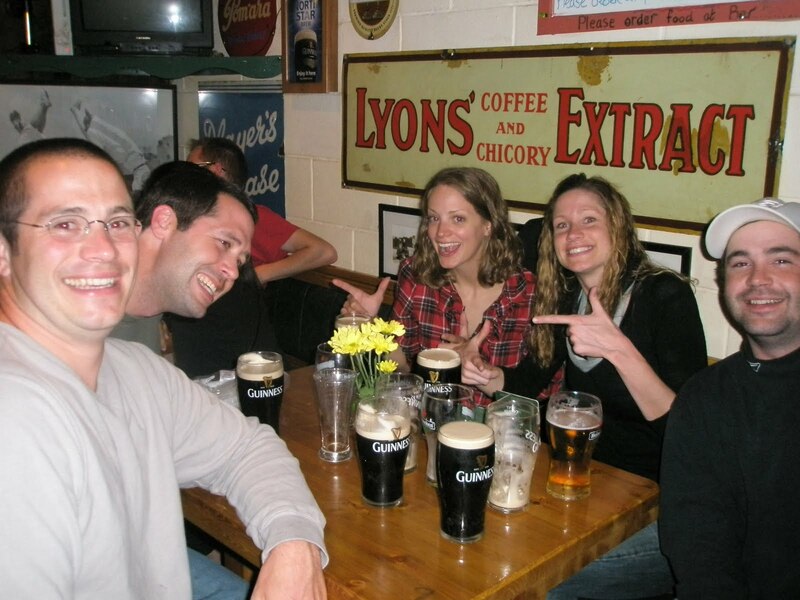 We sat at a private table by the store front, wine boxes stacked as an informal half-wall for semi-privacy, but the friendly atmosphere was contagious. The ambience is unpretentious, a plain black chalkboard with the menu written across, wine racks covering an entire wall and the owner mingling with diners and sharing advice on wine selection and answering questions about the menu. An assortment of olives for an appetizer was delicious and the escargot was to die for, but the beef bourguignon was simply the best either of us had ever tasted. Naturally, being in the middle of the Burgundy region, the wine was excellent. On a lazy stroll back to our apartment, it seemed as though we were walking through the Middle Ages. 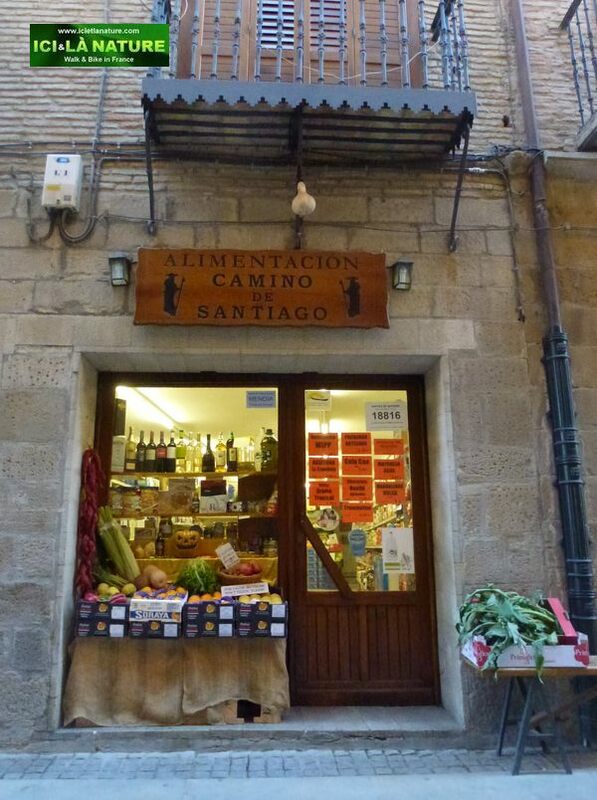 The buildings that lined the cobblestone streets, the architecture, different shades of brown masonry and the flower pots that sat on wrought iron-enclosed balconies give the town an Old European feel. We crossed the border road and opened a large, heavy wooden door that protected the peaceful courtyard of our temporary quarters like a fortress. A final glass of Pinot Noir capped a wonderful evening in Beaune. Open air market selling local produce, cheeses, cookery and more. We woke in the morning to a wonderful European breakfast of fruit, rolls, juices, eggs and coffee that we shared with a couple from Great Britain. Our host encouraged us to go to the Saturday morning market before we left town, so we walked across the street to a bustling outdoor market. 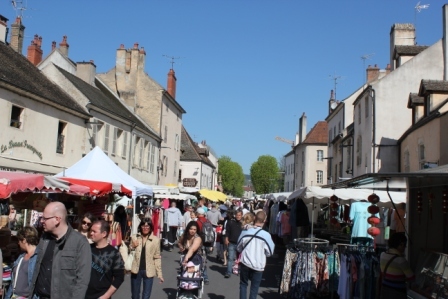 Vendors lined the streets and sold produce, vegetables meat, cheeses, chocolate, flowers, homemade clothing, cookery, toys and crafts. 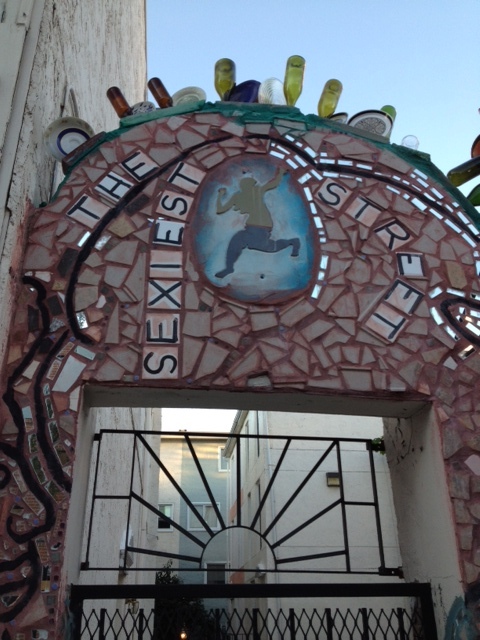 As we strolled along the streets, we noticed it was impossible to walk ten paces without passing a wine shop. We decided to stop and order a case of fine Burgundy wine to ship back home. The morning was a whirlwind of fun, and a perfect ending to our stay in Beaune. See more pictures of Beaune here. 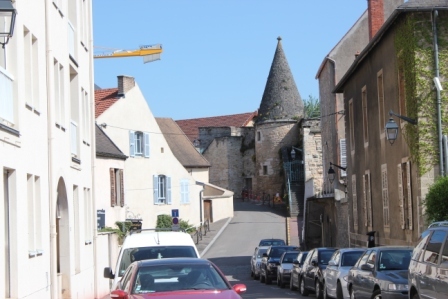 On the road to the quaint and peaceful town of Aloxe-Corton in Burgundy, France. 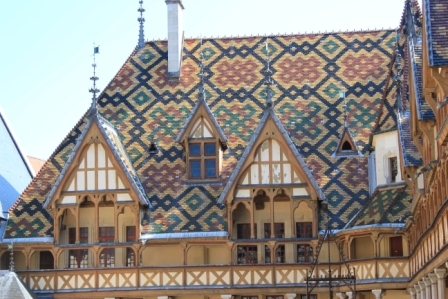 Driving from Beaune, considered by many as the capital of Burgundy, my wife and I drove through what wine connoisseurs consider the richest and most productive wine region in the world. 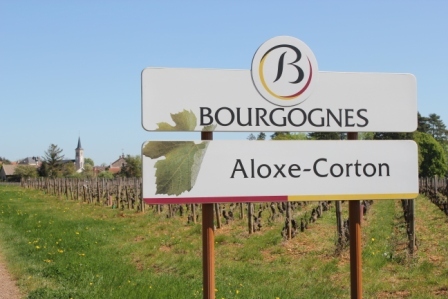 Not far outside town we came across the small and quaint village of Aloxe-Corton. The town was completely surrounded by miles and miles of lush, hill-covered vineyards. 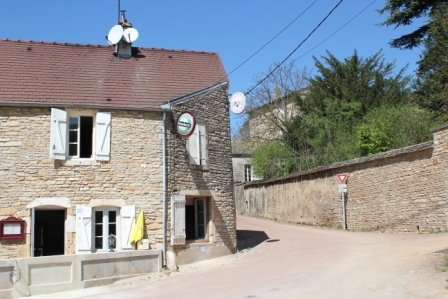 The La Grappe de Pernand sitting on a quiet road in Aloxe-Corton. 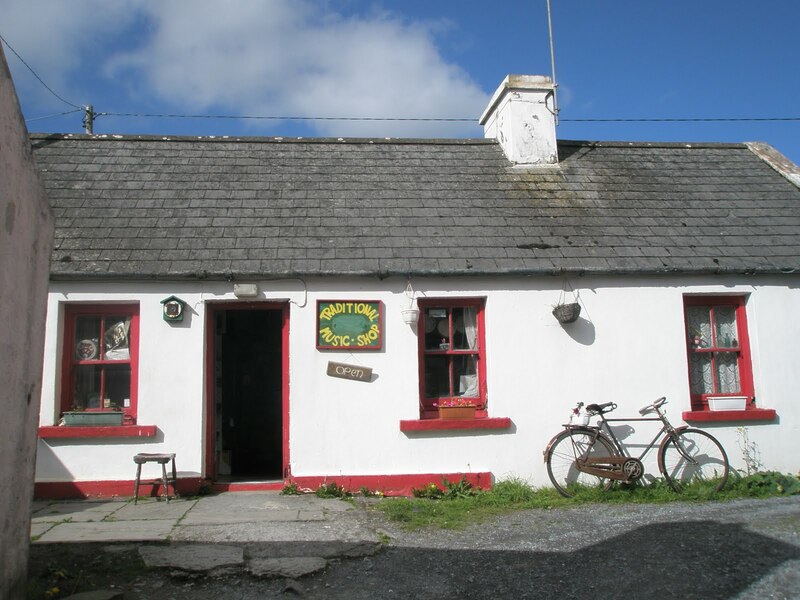 We were both hungry so we pulled to the side of the road and parked across from a stone-walled café at the bottom of a hill. A bright sign announced La Grappe de Pernand, a restaurant that turned out to be one of those rare finds with fabulous food, but too unpretentious to have a website. 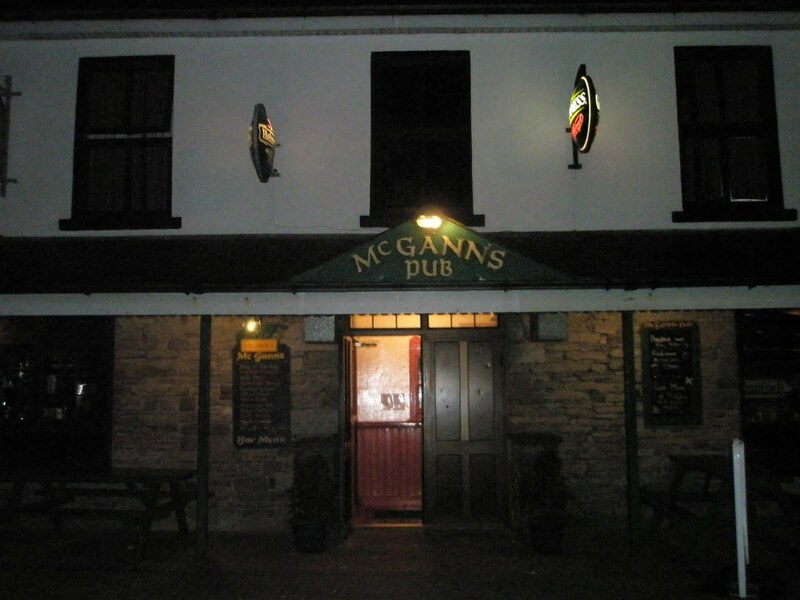 We walked through the door and only an older man and woman were sitting at a table against the far wall, nobody was tending the bar or waiting tables. The woman got up, walked over and welcomed us. She then handed each of us a menu. We ordered salads with Dijon dressing and quiche that was a medley of herbs, vegetables, cheeses in a light, flaky crust. Our lunch was topped off with delicious red wine, possibly the best I had ever tasted. After all, we were sitting in a traditional café in the middle of Burgundy. When we were finished and paid our tab, we asked in our very best French where to find the highest elevation in town so we could take pictures out over the vineyards. Our host pointed as she gave us directions in her best English. 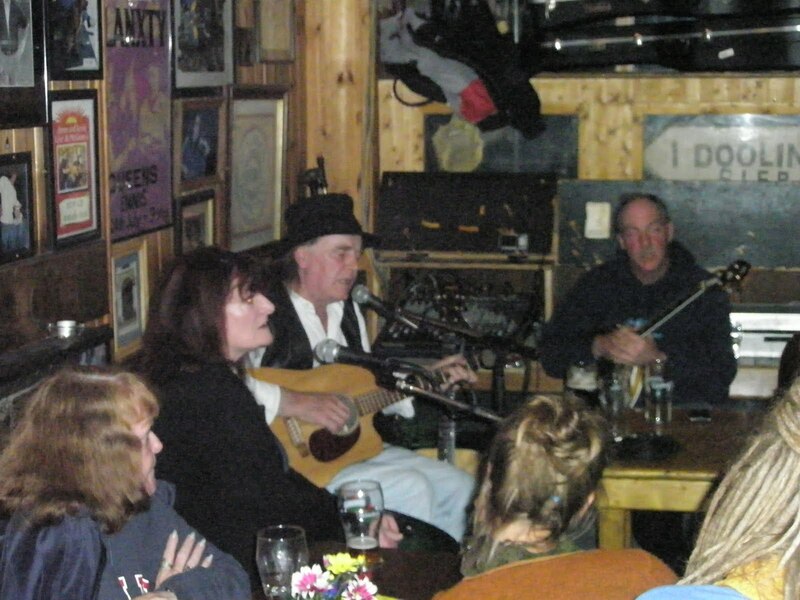 Between the three of us, we had felt pretty comfortable we knew where to go. When we pulled out of the parking lot, the woman had come out of the café to wave as we drove by, and we returned her wave enthusiastically. 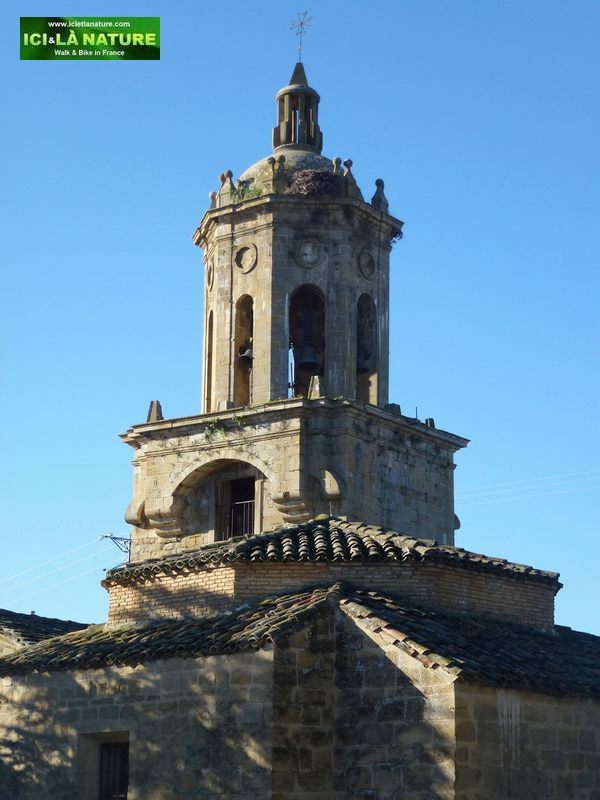 As the car climbed the hill through narrow streets in the ancient village, we came across a centuries-old church with the large, wooden front door wide open, as if inviting us in. I instinctively pulled up next to the building and walked into the simple church with high, vaulted ceilings and stained glass windows. The masonry and tiled floors led to a beautifully unpretentious altar. 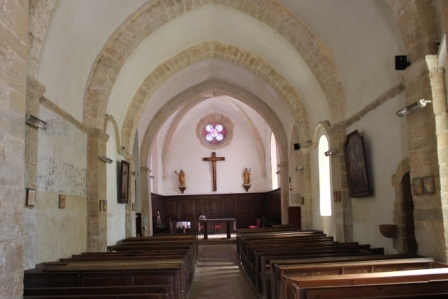 Religious statues stood behind each side of the altar with a crucifix hanging in the middle. 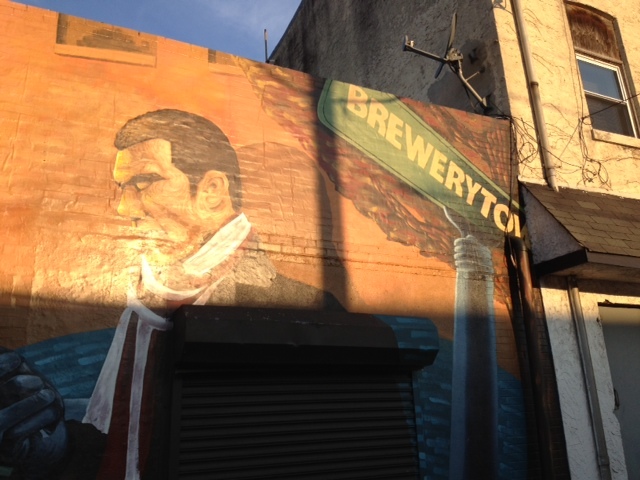 The masonry walls were adorned with Stations of the Cross that appeared painted ceramic. We bowed our heads as we left, then continued up the hill. When we thought we had reached the hilltop, I made a right turn to find the fields, but was struck by a grotto under a house at the corner of the road. 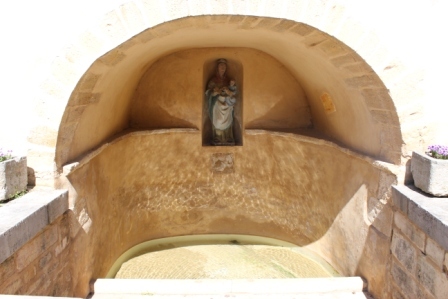 The house looked no different from the others, yet underneath was a fountain with a statue of Mary. I pulled to the side of the road, opened the door and walked over to the amazing grotto. I walked down the few steps that led to the fountain and was in awe of its simplicity. A peaceful presence filled the shrine as I stood in silence. After a few minutes, I walked back to the car and continued up the road that soon opened into spacious fields covered with rows of grape vines. 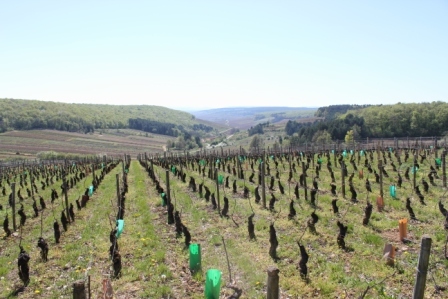 We finally made it, the top of the hill with an extraordinary view of Burgundy vineyards. We got out of the car and took in the spectacular views, and I shot pictures of the lush countryside. It was a perfect ending to our visit to the Burgundy wine region.